Myriopholis algeriensis. Tazenakht. Photo: © Raúl León. Gabriel Martínez del Mármol Marín (2012): Myriopholis algeriensis (Jacquet, 1895). In: Martínez, G., León, R., Jiménez-Robles, O., González De la Vega, J. P., Gabari, V., Rebollo, B., Sánchez-Tójar, A., Fernández-Cardenete, J. R., Gállego, J. (Eds.). Moroccoherps. Amphibians and Reptiles of Morocco and Western Sahara. Available from www.moroccoherps.com/en/ficha/Myriopholis_algeriensis/. Version 23/09/2012. Accessed 25 Apr 2019. Global range map of Myriopholis algeriensis according to the IUCN. In the past was known as Leptotyphlops macrorhynchus subspecies (Hahn & Wallach, 1998), was elevated to species rank in 2002 (Trapé, 2002) and it has been including in Myriopholis genus in 2009 (Adalsteinsson et al., 2009). 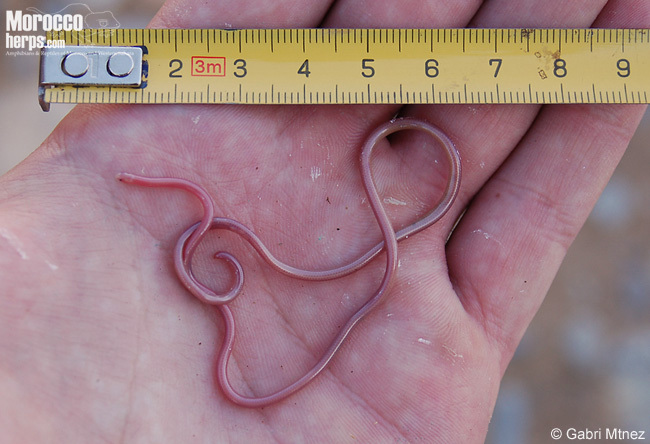 It´s the smallest snake in Morocco and Western Sahara with a maximum size of 28,5 cm (Bons & Geniez, 1996; Trape & Mané, 2006). It has a pinkish body, thin and large. Head not differs from the rest of the body. Eyes are black and relatively big, covered by two transparent scales. It has a big rostral scale very prominent and in peak form. Its mouth is small. Ventral scales are similar to dorsal scales. It has between 490-569 longitudinal scales, between 41-47 subcaudal scales, it has 14 scales at midbody and 10 at the middle of the tail (Trape & Mané, 2006). Myriopholis algeriensis. Errachidia. Photo: © Gabri Mtnez. Species predominantly crepuscular and nocturnal (Schleich et al., 1996; Trape & Mané, 2006). Its fossorial habits make it pass unnoticed and very little is known about this species. He spends most of his life underground, usually under big stones, where it feeds on ant larvae that are their main prey (Bons & Geniez, 1996; Trape & Mané, 2006). It occurs in deserts, semi-arid and arid areas in the pre-Saharan margins in Morocco and has been located in the Western Sahara just few times (Bons & Geniez, 1996; Geniez et al., 2004). Like other snakes of pre-Saharan areas must have higher densities in the oases and oueds where the food is more abundant. Typical habitat of Myriopholis algeriensis. Top: General landscape. Below. Detail. Errachidia. Photo: © Gabri Mtnez. 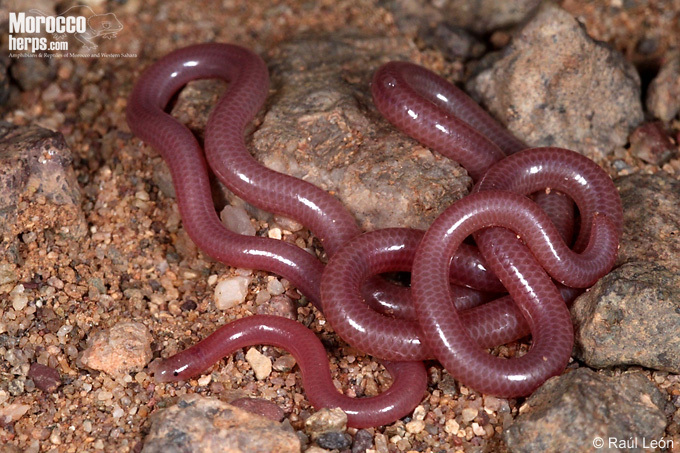 There are just a few records of this snake, although it can be due to its fossorial habits and the difficulty of finding this species, and the real distribution and abundance could be higher of the actually known.